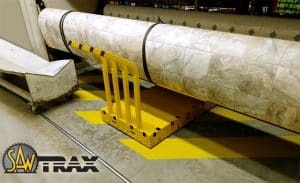 Blog | Page 2 of 5 | Saw Trax Manufacturing, Inc. Yesterday, we visited Atlanta Specialty Millwork to show them our Scoop Dolly in action. The demonstration went great! Because there was no dock transition plate, they needed two loaders to hand-carry a door unit into the truck. When the scoop dolly with the dock transition wheels rolled over the gap and into the truck, these guys were sold! Their current dolly also needed two guys for unloading – to keep the door or window unit from slamming into the wall and breaking. Not anymore! With our Scoop Dolly, the user can stand on the dolly when unloading. This means that the unit can be let down slowly without slamming into the wall. Thanks for letting us visit, ASM! We’re happy our Scoop Dolly can make your loaders’ work lives easier, faster, and more productive! Here at Saw Trax, we are always thinking of ways to make your life easier. Our carts are already super useful and maneuverable, but did you know that they could also be linked together to form a train? This can cut your workload tremendously. By using E-track slots to attach the dollies to one another, we created a way to move not only multiple items at one time, but also a complete variety of items that would usually require separate and different dollies. Imagine how much time you can save with this method! 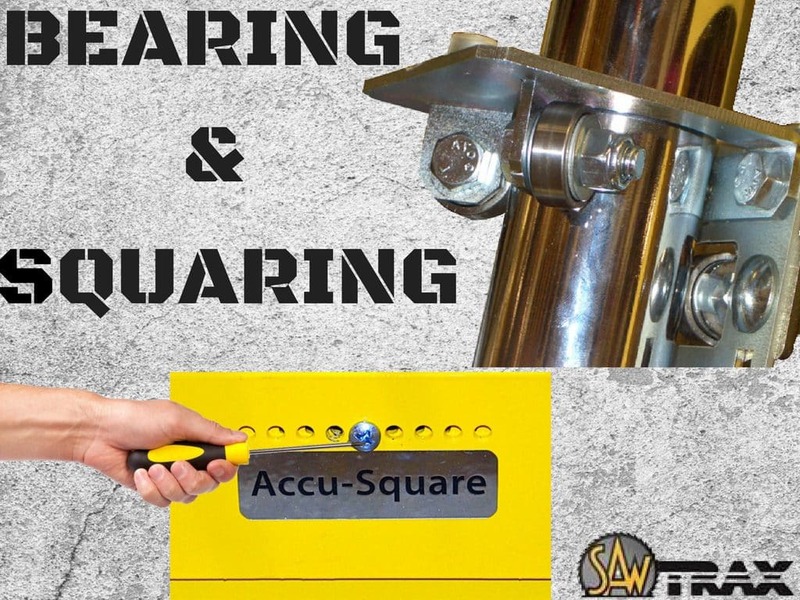 Remember … if there’s a way we can help you with your material handling needs, we’re here and we’re ready! Recently I bought an assortment of wood to build shelves in my garage. 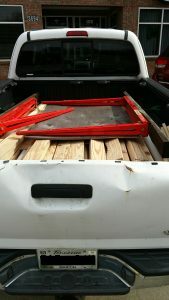 I had two by fours, pieces of plywood, one by fours, and two by twos, all tossed into the back of my pickup. 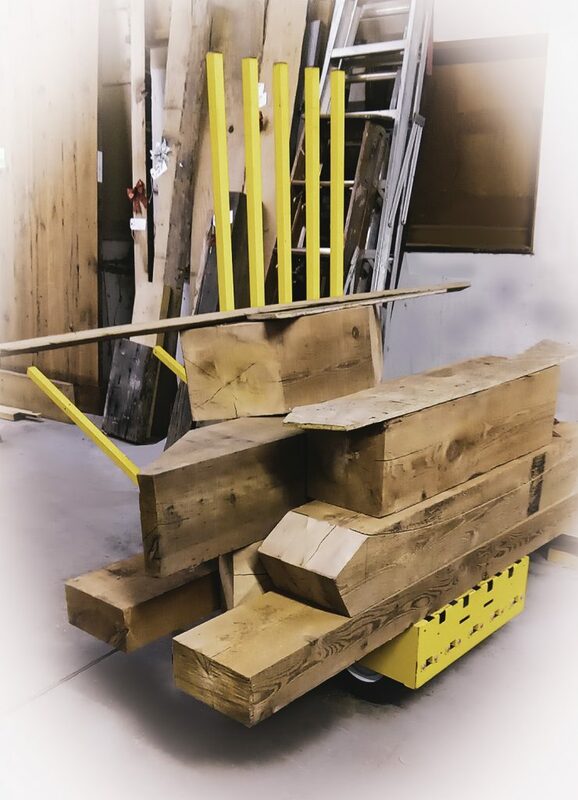 When I unloaded my truck, I was able to stack the wood in sections of my Dolly Max. This made it really easy to roll the wood right to my worktable and pull the right piece out, instead of walking back and forth and rummaging through the pile of stuff. In the garage I have folding sawhorses that I was able to pull out, throw a sheet of plywood on, and use as a worktable to build the shelves. What I really liked about this dolly was that I was able to sort the wood instead of rummaging through a stack of random lumber and looking for the right piece. I was also able to see where the knots were in certain pieces so that I could use those pieces on non-critical support areas. I’ve used this Dolly Max a number of times for moving items, but it turned out great as a mobile lumber rack! I was able to take it right up to my chop saw and work table. Having the wood sorted like this made building the shelves easier and faster. Every time I use the Dolly Max, it seems I find a new purpose for it! It is one of the best purchases I have made for my garage and workshop. 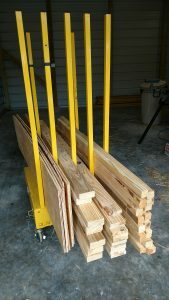 I may even take the dolly on my next trip to the lumber store and load it there, so it will already be organized when I get home. I think the employees there might get a little jealous. Would that be showing off? Maybe, but what the heck! Dolly Max worked great to sort out the wood! Bring It On…Dolly Max Can Take It! The Dolly Max hard at work at a specialty wood shop. This custom, specialty wood shop has a new workhorse! They just purchased the Dolly Max and put it to work right away. The Dolly Max is a portable, all-terrain multi-function cart with large 12.25″ foam tires that will never go flat. So easy to handle and maneuver, one person can move a ton (literally!). The Dolly Max design was inspired by a shop who liked the Panel Express for sheet goods, but also wanted to carry cabinets with the same cart. 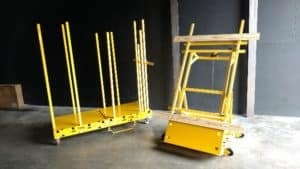 The Dolly Max is perfect as a tear-out dolly for demolition, moving dolly, sheet rock dolly, yard cart, mattress cart, moving dolly, furniture dolly, scaffolding dolly, fence dolly, lumber cart, drywall cart and more! With 5″ locking casters on front, the Dolly Max easily crosses thresholds, air hoses, yards, and other rough terrain. Easy to transport to the job site! Ok, maybe we don’t scratch this gentleman’s itch, but he still wouldn’t switch (apologies to the band Orleans)! This customer has had one of our panel saws for 20 years now. He’s so happy with it, that he took the time to come by our booth at SGIA 2018 to let us know! Our products are truly built to last. We didn’t know we would be making a family heirloom, but for close to 30 years we’ve been making products you can count on. The Scoop Dolly design came about because of our own need to move the vertical panel saws we build. 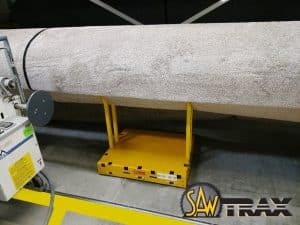 Just like the one in the video above, these saws can weigh up to 655 pounds and we needed a better way to move and load them. And when everyone’s busy working, the Scoop Dolly makes it easy for one person to handle the job! So easy in fact, that you can be a petite woman in heels! 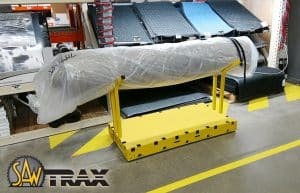 The Scoop Dolly is great for a variety of industries (such as window & door companies and staircase manufacturers) and warehouses; for products from large appliances to large boxed furniture! If you need to move bulky, large, top-heavy or heavy items, the Scoop Dolly is perfect for you. In many situations, the Scoop Dolly can take the place of a forklift, as well as reducing lifting injuries and workman’s comp claims. Check it out here! Let us introduce you to our latest dolly… The Rug Dolly! After visiting some carpet warehouses, we knew our Safety Dolly could be redesigned for their needs. By tweaking the post design, the Rug Dolly came to be! The Rug Dolly is easy to load, store, and maneuver. 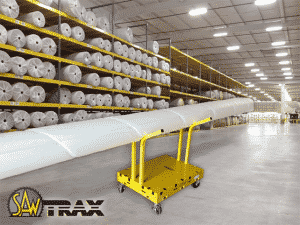 For carpet manufacturers, it’s carry height makes loading on multiple roll machines a breeze! 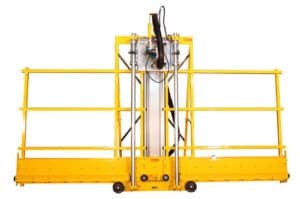 The all-caster design makes long loads extremely maneuverable. Re-positioning the posts (or laying them down on the base) makes the dolly incredibly space-saving and easy to store. The fact that it tucks out of way makes it perfect for warehouse clubs, where customer and employee safety is a priority. Our dollies are absolute workhorses! Built in the USA out of powder-coated steel, they are strong enough to move up to 1000 lbs, yet easily maneuverable and ergonomic enough for one person to handle. We are very proud of this new addition to our dolly and panel saw family! Rug Dolly at work at a local Home Depot. Handling the load with ease!